We aren't all neat freaks and one too many overzealous trips down the makeup aisle has left our bathroom drawers, medicine cabinets and makeup bags overflowing with stuff. Because that's what all your precious makeup becomes when you have one too many of everything, everywhere. Skip to learn how to organize your makeup like a pro now. But it isn't just stuff ladies, it is the makeup you used to love, but now resent as it never seems to remain organized. And we feel your pain. We know the clutter causes anxiety. We know you stop using things because it becomes too much effort to weed though all your lip glosses to find what you are looking for. We know you secretly just want to dump all your makeup in the bin and start new. We know. Well it's time to get it together. Spring-cleaning mumbo jumbo aside, now is the time for you to get organized. You and your makeup deserve it. It's time to toss the cracked eyeshadow, the six tubes of mascara and that lipstick you loved in 2005. It's time for a total overhaul. To find out the best and smartest ways to keep your stash in check, we went to Raychel Wade, New York City makeup artist, La Prairie Colour Ambassador and founder of Cheek to Chic as well as Justin Klosky of The O.C.D. Experience (Organize and Create Discipline). 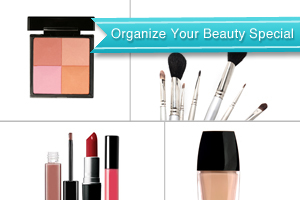 They offer up expert tips that'll help you keep your makeup organized and up-to-date. Now, see 7 tips that'll help you organize your makeup like a pro. I like the magnetic eye shadow one. I really need to use these tips to clean everything up. i just bought those 3 drawer storage things to stack on top of each other to use. wonderful to organize everything. The article is fabulous-I am a makeup JUNKIE-I have tried many time to organize and it makes a big difference especially for the fact we may be using expired products which at one time I really never even thought about-so I bravely trashed many items and if I really liked the color I ordered a new one which means only purchase what you're going to use (I should follow my own rule) but then we get caught up with new colors and become the bag lady of make-up again. I suppose if this is the only bad habit we have then it is what it is-but the fight will still go on. Its so hard being an organizing nazi, but being in college and not having a permanent residence! >. I love this post..and I am definitely one that needs to get rid of some of my makeup. But it is so HARD!!!! I love makeup and it is very hard to part with it. But I will...that just gives me a reason to buy more. Get a large well made train case. I did recently and it was the answer to all of my problems. Love this post because I have an outrageous amount of makeup. Being able to let some of it go it KEY! I need to do that. What Is Skin Fasting and Should You Try It?